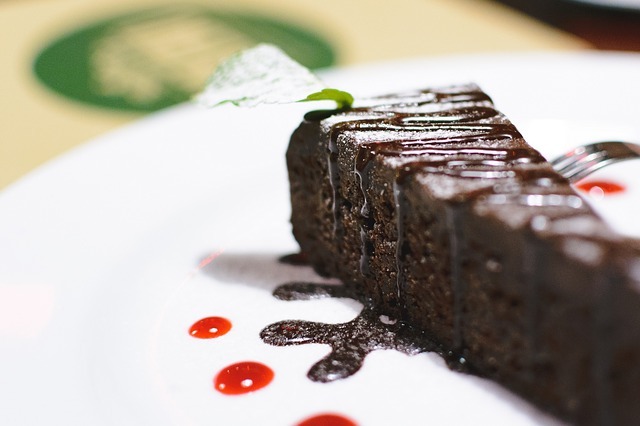 Chocolate dessert recipes include a flour-less paleo chocolate cake recipe which can be just as decadent as any luscious chocolate cake that you have eaten in a fancy restaurant. And you can make your very own chocolates with just a few ingredients. Learn how to make your very own authentic dark chocolates or learn how to make one of America's favorite candy, but only healthier. Making chocolate dessert recipes can be a lot of fun and helps you eliminate the ingredients that you no longer want to consume. Preheat your oven to 350 Degrees F and grease an 8 inch baking pan with coconut oil. Line the bottom of pan with parchment paper for easy cake removal. Melt the dark chocolate and coconut oil together in a double boiler. Then stir in the coconut milk until combined. Remove from heat and stir in the maple syrup, hazelnut extract, vanilla, and sea salt. Put the hazelnuts into a food processor and finely grind. Then mix the ground hazelnuts with the chocolate mixture. In a separate bowl, beat the eggs until fluffy and they double in volume. Then gently mix the eggs into the chocolate/hazelnut mixture until well combined. Pour the cake batter into the greased pan and wrap the sides of pan with aluminum foil. Place the pan into a deep baking dish and fill halfway with hot water. Bake for 30 to 35 minutes or until a toothpick inserted into the center of the cake comes out clean. Allow the cake to cool for a few minutes before removing cake from pan and placing on a serving plate. 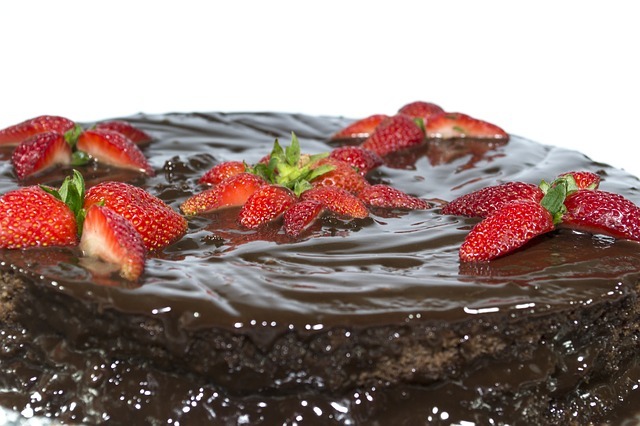 Top the cooled cake with a chocolate fudge sauce or chocolate ganache. Decorate this chocolate dessert recipe with chopped hazelnuts or fresh cut strawberries. Pick the bad cocoa beans out and throw them away. Put the cocoa beans into a heavy skillet to toast them to bring out their chocolate flavor. Start with a higher temperature and then lower heat when the beans are heated up. Stir constantly and do not let the beans burn! This process could take as little as 45 minutes to over an hour. Check the flavor of the beans periodically, by peeling away the shell. When the beans have reached a good flavor note, shell the cocoa beans one at a time or crush and winnow the beans. Combine the sugar and beans in a bowl. Then put the mixture into the food grinder. And keep grinding until the chocolate becomes a chocolate liquor. You can now make your chocolates and harden them in the refrigerator - if you decide to skip tempering. You will also need to store these chocolate dessert recipes in the refrigerator if you skip that step. In a bowl mix the peanut butter, sweetener, and 1 Tbsp. of coconut flour (add more if needed) together to form a wet cookie dough texture. Use a cookie scoop to drop 1 Tbsp. of peanut butter mixture onto a parchment lined baking sheet. Slightly flatten top with your fingertips and freeze for 20 minutes. In about 20 minutes, melt your chocolate bar using a small double boiler or your preferred method. Be sure to transfer the melted chocolate to a small glass bowl. I would temper the chocolate if you want to store Reese's eggs at room temperature. With a fork, quickly dip each peanut butter scoop into the melted chocolate. Coat evenly and sprinkle with salt at this point if you so desire. Transfer back to parchment lined baking sheet to harden (you can harden in freezer if using chocolate that is not tempered). When you buy a chocolate bar from the grocery store, it is already "in-temper". Being "in-temper" means that all of the fat crystals are aligned which gives chocolate bars that perfect snap and shine. When you melt this chocolate bar, you will be taking it out of temper and it will have a low melting point. Thankfully, you can temper melted chocolate to re-align its beta crystals. You could melt chocolate up to 122 Degrees F and cool it back down to approximately 88 Degrees F while stirring. You can also seed melted chocolate with some pieces of hard tempered chocolate while stirring to help properly re-align the melted chocolate. Properly tempering chocolate may require more than 1 chocolate bar - especially if using a double boiler method for melting the chocolate. However, you can always re-use the extra tempered chocolate for the next recipe. Just let it harden and store for future use.